The combo was taking five. The drummer stood next to the table, wringing a pair of sticks in his fists. Patryk smelled the drummer’s sweat. He swallowed hard, forcing down the sandwich. “It’s okay,” Pat said. He forced up a smile with the same effort as he forced down the sandwich. “Can you autograph one of my sticks?” The drummer handed over a white, Buddy Rich signature series stick. “Sure. That’s a first for me.” Pat took a fine-tipped Sharpie out of his inside pocket. He bought them in bulk and carried two everywhere. Becky placed her napkin on the table, smoothed out her dress, and stood up. She looked regal, like the Hollywood starlets of the past. Patryk always thought Becky had been born a few decades too late. Patryk noticed a minute twitch of her lip as she said it, like a rabbit frozen before a predator, worrying that the slightest movement would draw toothy death. Dave didn’t seem to notice. “That would be amazing,” Dave said. “We’re going back on. I’ve got something special for you. Thanks again.” David ran back to his four-piece drum kit. He aggressively called the rest of the combo back to the stage. Patryk and Becky had just sat down when the music started. “That Old Devil Moon” from Finian’s Rainbow. Patryk would recognize it anywhere. He sang it to Becky on Broadway, just before the cast party kiss that sealed their fates. Before fame. Before movies. The beginning of it all. Patryk rubbed tears back from his eyes. Becky kept the facade in place. She stepped around the table to Patryk and took his hand delicately into hers. Patrick felt the soft, fine hairs on the back of her hand. “They expect us to dance,” Becky said. Patryk put his hands on Becky’s waist.They swayed in time with the music. The combo’s singer, a woman in a long sequined dress with a slit up one leg, sang about a glace being too hot to handle. Patryk pulled Becky close. He smelled perfume, sweat, and pheromones, the familiar scent of her. He could taste it upon his tongue. He salivated. Becky winced as his hands drug tighter into her hips. Patryk stepped back. Becky’s facade began to break. Her mouth quivered. She struggled to hold the perfect image all in place. “I’m tired,” she said. “I’ll be back at the room.” Becky walked away, a starlet queen, so much in contrast to the fearful wife that Patryk knew hid beneath the surface. Fear of him. He sighed as the combo reached the coda. Patryk dropped some money upon the table. Most of the guests had stopped tipping after the ship broke down, as if the wait staff had anything to do with it. Patryk pulled the silver steak knife out of the tightly wrapped formal dining ware and stuffed in in his pocket. He waved to Dave, who gave him a nod. Patryk leaned upon the metal deck railing and looked out over the ocean. 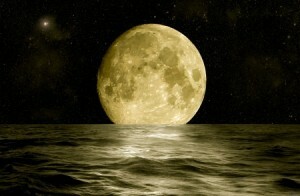 The nearly full moon danced upon the currents. Patryk felt it, hot like the sun upon burned skin. His bones ached. Patryk wanted to pray for an answer, but would God answer an animal? Patryk didn’t know how long he stood there. The moon tended to envelope his mind. Entire nights passed in moments, leaving barely a memory. The band had stopped playing, and Becky had stopped crying. He could hear the steady slow breath of her sleeping two decks above. He could smell her. Becky had begged him to go on the cruise. She wanted to get away, just the two of them, before shooting schedules would keep them apart for weeks. She assured him there would be plenty of time to get him back home to their basement. There had been the fire in the ship’s engine room. The crew worked desperately to fix it. They promised they would be up and running in a couple of days. Time had run out tonight. What would a werewolf do aboard a cruise ship full of people with nowhere to run? Not a single room on the ship could hold him. They weren’t designed to withstand the supernatural. The crew might have guns, be he doubted those cartridges held silver. Tomorrow night would bring an all-you-can-eat buffet. Patryk wiped drool way from his mouth and sobbed. Patryk heard and smelled Dave long before he got there. He just didn’t care. Dave had been there for the beginning. It felt right that he’d be there at the end. “Rough night,” Patryk said, wiping his eyes and nose. “I’m sorry, what?” Dave turned pale. Dave stared at the star dusted sky. Normally, Patryk should have stargazed with him, the stars were so beautiful out on the ocean. Instead, he stared at Dave’s throat. Muscle and tendon strained beneath pink flesh. Patryk listened to the steady thrum of Dave’s heart, the rushing cadence of warm blood pumping through his arteries. “It’s going to be a Hell of a full moon tomorrow night,” Dave said. Already, the moon pulled at Patryk. It’s gravity tugged at every hair follicle, it’s pale light soaked deep into his brain. It whispered to him. Tomorrow, it would be a shout. A scream. Dave looked like he might say something, but words failed him. He left Patryk standing alone at the railing, looking down at the water. Right now, Dave couldn’t wait to get away. Tomorrow, he would blame himself for not staying. Patryk pulled the silver steak knife out of his pocket. The well-polished surface glittered beneath the moonlight. The crew worked so hard to keep up the appearance of normalcy, like Becky, like the band, like Patryk. Look the part. Play the part. Be the part. It would be normal. Just another movie star accident, easily explained by drugs and alcohol. They were a dime a dozen. They would show his picture at the Oscars with all the other dead. They would camp outside his mansion gates and offer sympathy in lieu of privacy to his widow. They would play his movies in a memorial marathon. Normalcy. Such a hard part to play. The knife was not ideal, but with the moon already strengthening him, he could play the part forever. Patryk sang the coda to himself, just under his breath. “Just when I think I’m free as a dove…old devil moon, deep in your eyes, blinds me with love.” The animal in Patryk roared as he thrust the knife into his chest and then threw himself into the waiting ocean.